This very unusual tattoo was inked by tattoo artist Rytch Soddy. It can be really fun actually. 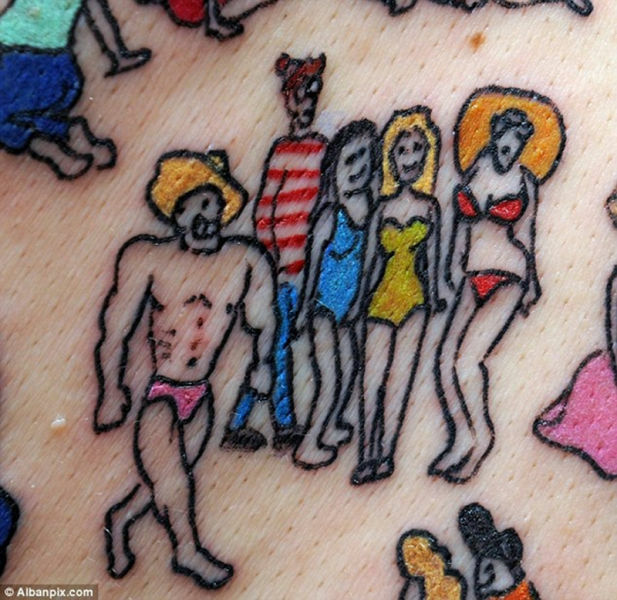 It took the tattooer 24 hours to create the scene that featured 150 characters with Wally (Waldo) among them on the back of John Mosely, 22, a music producer from Norwich. Mr Mosley decided on having this tattoo inked due to his happy childhood memories of looking at Where's Wally books which feature pictures of the character hidden in unusual settings. The finished tattoo also shows a view of Norwich with the city's castle and two cathedrals in the background. "I still have not seen the finished result so I don't know where Wally is on my back," said John Mosely.